The BBC is to broadcast a major e-sports tournament over the next six weeks. 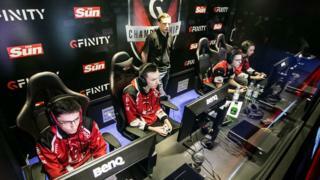 It will show coverage of the Gfinity Elite Series contest every weekend on BBC Three online. Some 160 gamers will compete in front of live crowds for a £225,000 prize. There are already places where large numbers of viewers watch e-sports, but one analyst said the BBC's coverage could attract new viewers to the genre. Under the deal, the BBC will include broadcasts of exclusive editorial content from the Gfinity tournament in west London. The games to be played include fighting title Street Fighter V, first person shooter Counter Strike: Global Offensive, and robot football game Rocket League. Currently, online streaming channels Twitch and YouTube command the biggest audiences for e-sports, although events are also now being shown on conventional TV stations such as Ginx in the UK. The BBC has broadcast highlights of e-sports tournaments in the past, but said the Gfinity coverage would be "on a much larger scale". Image caption E-sports events are growing in popularity and can attract millions of viewers online. Piers Harding-Rolls, an analyst at IHS, said the BBC would be able test the demand for e-sports on its network. "It's correct to engage with the types of content that are really resonating with younger viewers, and e-sports is growing in popularity," he said. "Yes, YouTube and Twitch have scale but the BBC touches on a wider audience which could bring new viewers. "It would be a bigger risk if it was being shown on terrestrial TV, but this is online, so it's an opportunity to test whether it will work." E-sports events are growing in popularity and can attract millions of viewers online. Analyst Newzoo has predicted that global audience figures will double to nearly 600 million by 2020, with revenues passing £1bn. The first stage of the Gfinity tournament will be shown on Friday at 20:45 BST on the BBC Three website and iPlayer. It will be followed by episodes on Saturday at 21:00 and Sunday at 17:00.